We bought her from a breeder and is full pedigree; she is classed as 'blue' but in my opinion i dont really think she looks very much like a blue GSD?? I think she has a bi coloured blanket coat?! Any feedback on your opinion would be great! 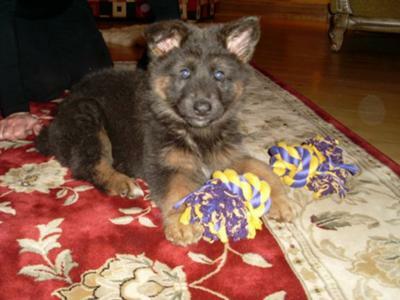 Lexie is my first GSD and i am obsessed with researching and finding out as much as i can about the breed... We are also keen to buy another GSD pretty soon and thinking of getting the classic black and gold saddle back.. I hope you enjoy the pics i have sent! congratulations , she is beautiful! As a long time German Shepherd owner I can only recommend: never forget who the boss is! Shepherds are usually very headstrong and like to take over, so you need to make sure every day that she understands that you are the pack leader! It's one of their fabulous trades that can cause problems if not 'channeled' the right way. German Shepherds can be very intimidating to others, and when not trained right they can be downright scary to non family- out of their pure sense of protection. So the best way to utilize their incredible energy and instincts is to train them properly - remember, a leash is the connection between you and your dog, you feel her , she feels you...how awesome when you have that connection without the leash and a look or handsign is all it takes.